The Scoop: H4M is a premier gay and lesbian matchmaking company based in Austin, Texas. Since 2012, this boutique firm has become an ally to LGBTQ singles looking for love. 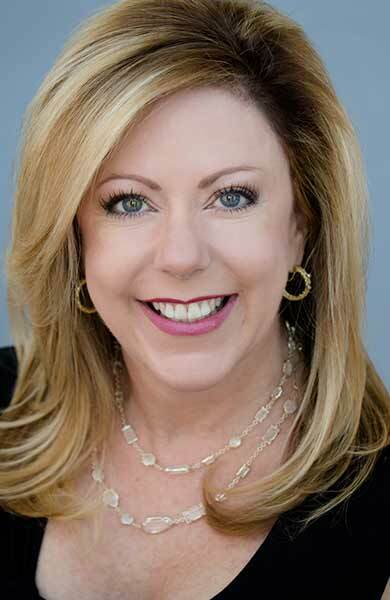 Head matchmaker Tammy Shaklee has worked hard to make traditional matchmaking and dating coaching services available to LGBTQ singles across the country. Thanks to her inclusive and collaborative spirit, H4M has successfully won the hearts of hundreds of serious daters. After her divorce, Tammy Shaklee moved to Austin, Texas, to make a fresh start. She took a leadership position in the Make-A-Wish Foundation and focused on living her best life. She thought she would meet men and go on dates organically, but a two-year dating dry spell proved otherwise. Tammy Shaklee founded H4M to make traditional matchmaking accessible to LGBTQ singles. Tammy didn’t want to publish her personal information on a dating site, so she decided to seek a more private and personalized solution. She hired a professional matchmaker, and that did the trick. Tammy and her second husband met through an arranged date, and they couldn’t be happier now. Years later, Tammy tried to refer one of her single friends to the matchmaker and learned that the service was for straight singles only. Her friend was a gay man, so he couldn’t use the same resource Tammy did to find love. H4M began as a niche matchmaking service for gay men, but it has since expanded to include lesbian singles, bisexual singles, transgender singles, and queer singles. Tammy has reached out to the LGBTQ community and learned about their dating needs by conducting focus groups, one-on-one interviews, and personal conversations. Today, Tammy is a well-informed straight ally and matchmaker with the contacts and know-how to match clients in great partnerships. H4M matchmakers are focused on delivering a quality dating experience, and that takes a lot of conscientious hard work. They carefully screen new clients in two separate phone/Skype calls to ensure their matchmaking system is the right fit. Tammy said she looks for clients who know what they want and are ready to be in a relationship. H4M’s process is designed to help individuals find a committed and loving partner. H4M currently has 100 active clients from coast to coast. The youngest client is 23, and the oldest client is 77, but most are in their 30s, 40s, and 50s. 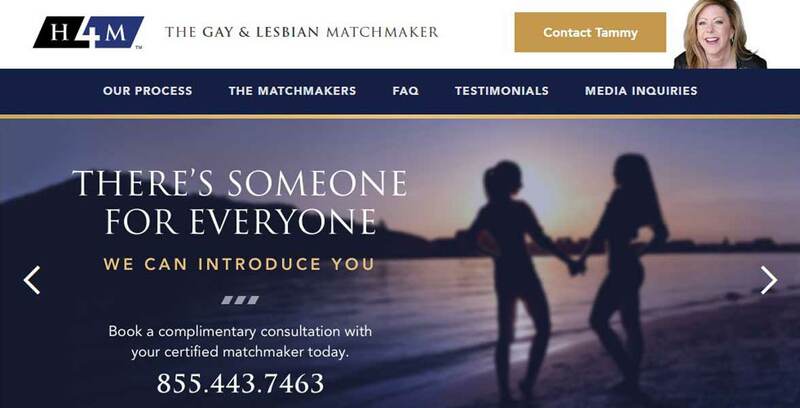 The matchmakers serve the entire LGBTQ spectrum, and they welcome diversity in their ranks. Tammy said the typical client is well-educated, relationship-minded, and tired of online dating. They want to try something new, and H4M is a reliable partner throughout the dating process. The matchmakers are traditionalists, so they don’t show clients any photos of their potential matches. They don’t focus on superficial qualities. Instead, they look for common goals, lifestyles, and interests as the basis for an introduction. It takes a little bit of knowledge and a lot of intuition, but H4M’s team has years of experience getting it right. H4M matchmakers take the time to get to know each client and prioritize his or her needs. H4M arranges both the first and second dates for their clients, and they ask for feedback along the way so they can fine-tune their matches and make them a positive experience. Many of Tammy’s clients come through referrals from either a former client or another matchmaker. Tammy said she’s always happy to work with her colleagues in the dating industry to ensure clients have the best possible experience. Her collaborative spirit has enabled her to grow her business and support love stories for singles of all orientations. Feedback is a huge part of H4M’s matchmaking process. The matchmakers conduct post-date feedback calls after the first and second dates to ascertain how the introductions went and how the client is feeling. These dating and relationship experts offer unlimited coaching throughout the matchmaking experience because they believe it’s important to guide singles while introducing them to potential matches. They want to emotionally and mentally prepare their clients to knock it out of the park on every single date. The ultimate goal is to teach clients how to be successful daters with or without the help of a matchmaker. That way, they can carry those lessons with them as they navigate the dating scene on their own. H4M matchmakers can lend insight on everything from what questions to ask on a first date to how to build a foundation of trust in a relationship. They can address the emotional concerns and insecurities faced by LGBTQ singles and offer practical solutions to help them move forward. Tammy told us that while LGBTQ singles have some unique dating challenges, they also have a lot in common with straight singles when it comes to love. H4M is a boutique company on a mission to change lives one match at a time, and the matchmakers accomplish this by listening to their clients and taking every introduction seriously. They don’t just throw darts at the wall and pair up dates at random. They carefully arrange first dates (and second dates, too) to suit the preferences and goals of each individual. H4M bolsters its clients’ confidence so they’re emotionally ready to meet that special someone. Over the years, H4M’s curated matchmaking process has yielded positive results, and the team has quite a few positive testimonials to their credit. When Tammy discovered gay singles in Austin, Texas, didn’t have access to the same dating services as straight singles, she took action to fill that void and make sure those voices were represented in the matchmaking world. Now she has expanded her operation to serve the LGBTQ community from coast to coast. H4M has made hundreds of successful matches, and it’s just getting started. Tammy is currently growing her network of bisexual and transgender singles, and she told us she’s excited to hear their stories and help them overcome their dating challenges. 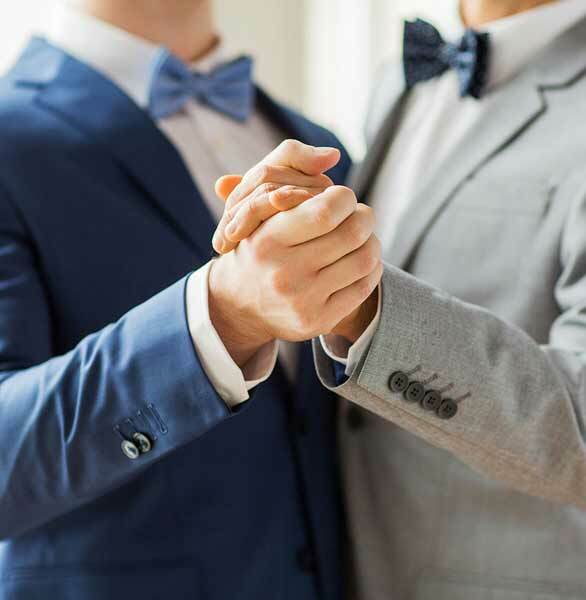 For the last six years, this rainbow matchmaking company has been a friend, mentor, and wingman to gay and lesbian singles who are serious about finding love, and Tammy has never lost sight of the importance of that mission.